Thanks for the comments. I'll probably release an updated version of it pretty soon. I spent much of memorial day trying things out and expanding on it. I almost wanted to start experimenting with prototyping RTS controls about halfway through making this. Didn't have near enough time to switch gears like that though. Sorry to hear the locomotion method didn't work out for everyone. I guess that's kind-of expected though. Very cool proof of concept! I learned a lot from playing this, and had fun too. Gotta say, even though it goes against the central premise of the game, I really wanted to smack missiles out of the sky with my hands! Things that were good: This is fun, I love the extendo thing for the controllers, aiming was nice and easy. 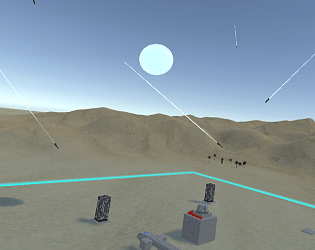 I think the basic idea of missile command in vr is really good. I just wonder if it really needs adapting a bit (a different setting that allows for a more VR friendly scale or something).